For this weekend only, we are having an early special for registration! Register anytime between today and Sunday, August 28th, 11:59pm for an early special of $199 for a quad, $309 for a double. Regular registration prices will go back to $219 for a quad, and $329 for a double after this weekend! 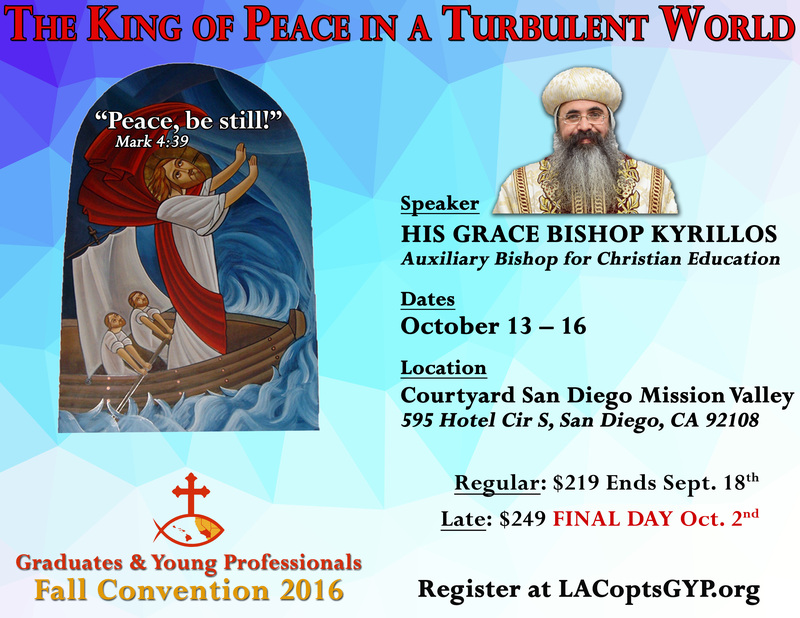 2016 GYP Convention: Register Today! Under the auspices of His Eminence Metropolitan Serapion, the Graduates and Young Professionals (GYP) committee invites you to the 12th Annual GYP Convention on October 13-16, 2016. 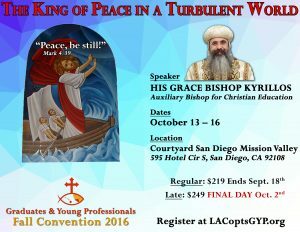 This year we are blessed to have His Grace Bishop Kyrillos formerly Fr. John Paul of the Saint Paul Brotherhood, will lead spiritual and introspection discussion as our speaker.